After retiring early to catch up on my sleep, suddenly the albergue was invaded by a huge party of bag taxi-ing ‘pilgrims’. The dormitory was in two sections and all of the section that I was in had settled down when the very noisy invasion took place at lights-out time of 10 pm. Much harrumphing took place amongst us sleepy ones, whilst much loud talking and merriment was made amongst the newcomers. I immediately inserted ear plugs and hoped for the best and as the bed above me was vacant I pinched the pillow to put under my calves so that my heels did not touch the mattress, as this still causes discomfort. I was aware of commotion for a long time but was cushioned from the worst of it by the ear plugs. During the night I became aware that someone was sleeping in the bunk above me and immediately became conscious that I had stolen their pillow, which led to me having anxious dreams about taking things which weren’t mine. But at least I slept until people started moving about in the morning. A lot of pilgrims sleep in the clothes they are going to walk in the next day so that they can make a quick and quiet get-away. These are the people who leave very early, often well before dawn. I hate the idea of this (both sleeping fully dressed and leaving before dawn!). I find it uncomfortable sleeping in anything and have had to get used to vest and pants or on cold nights long-johns and T-shirt, but have always worn different clothes to walk in. I slept quite late – almost 7 am – brilliant! I got up and quietly gathered my stuff together. Half of the dormitory was already up or stirring, and the other half were still fast asleep. There is a point in the morning where there are more people awake, fumbling in the dark than there are still trying to sleep. I have no qualms about turning the lights on at 7 am as this is a reasonable time to expect everyone to be making a move. However of course the noisy lot from last night who wanted the lights on after 10 pm were not so keen for the lights at 7 am. Tough, as far as I am concerned. I used the spacious disabled loo that no one else had discovered but someone tried the door before I was finished. I wasn’t in any particular hurry as there were other facilities available. But when I emerged I was confronted with a man in a wheelchair waiting very patiently and thanking me for opening the door wide for him. So I had stolen a pillow during the night and deprived a disabled person of his rightful use of facilities in the morning. It was a good job I wasn’t planning on going back to sleep, or I would probably have had nightmares about my inconsiderate behaviour. I suspect that the party of people that arrived late had an element of disabled people amongst them, which doesn’t excuse the racket they made but does make me think twice about making swift judgments about others’ behaviour. 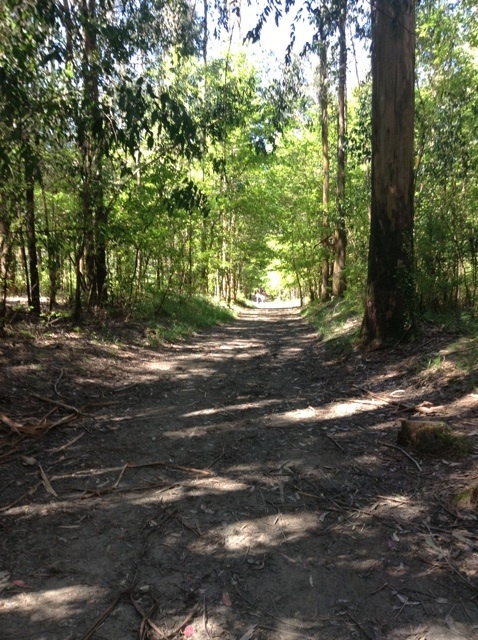 The morning was bright and sunny and the first section of the walk was through beautiful wooded countryside. 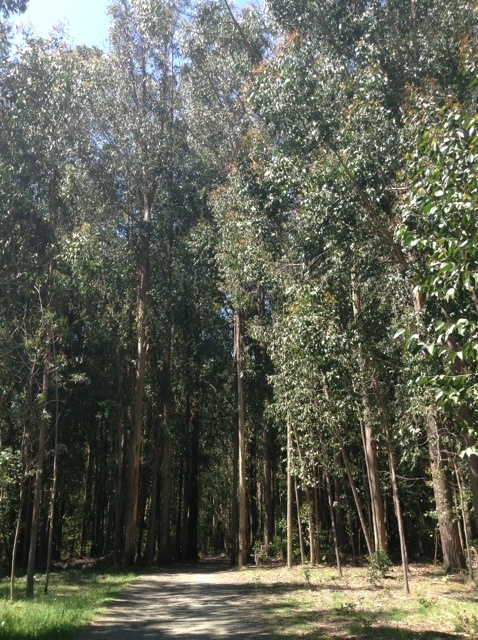 We are now in an area of eucalyptus forrest, a mixture of giant mature trees soaring completely straight towards the sky, newly planted saplings, and every size in between. We stopped for breakfast and had a beautiful view from the terrace of the cafe. 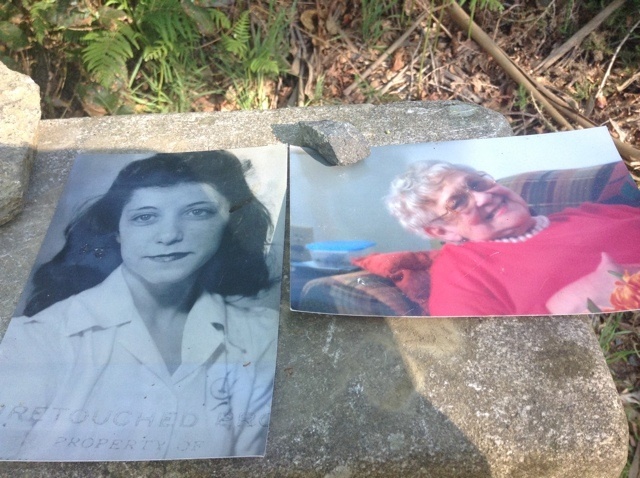 During the walk we came across a couple of photos under a stone sitting on top of a way marker. I stopped to have a look and was moved to tears. On the back of the photo of an elderly woman was written, “this is my mother ….name…. who always wanted to travel but couldn’t because of health issues. 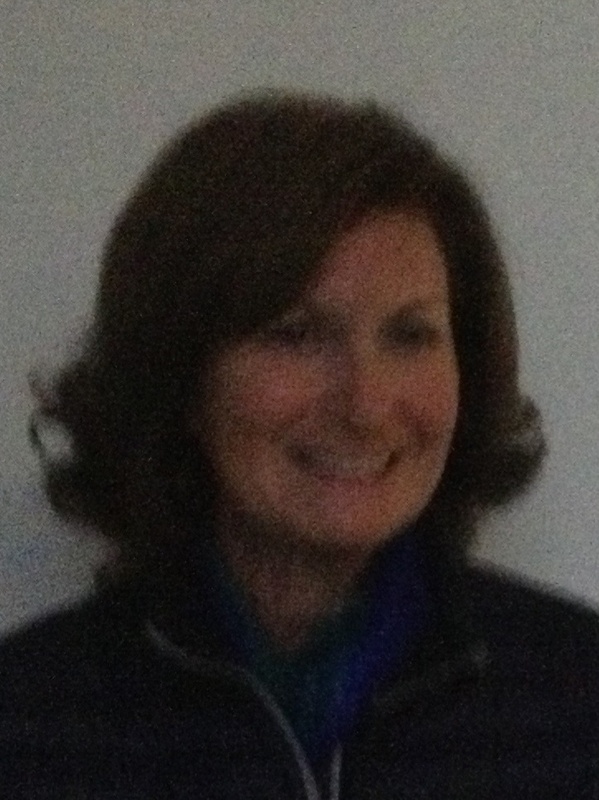 Mum, I am walking the camino for you”. It has just brought tears to my eyes again. How lovely. We also came across a memorial to to a guy who died of a heart attack whilst walking the camino, only 20 km from his goal. He was 69 and died in 1993, which was a holy year. If St James’ anniversary (not sure if birthday or date of death) falls on a Sunday the year is assigned holy status and anyone who is granted a Compostela in that year has all their sins to date absolved. Although it is to be a short day I still go through my black patch in the late morning and we eventually stop at 12:30 pm for a beer-and-boots-off rest. We only have to trek a further 4 km to reach our destination and arrive by just after 1 pm. It is a nice-ish, big-ish town and we choose a very nice albergue. 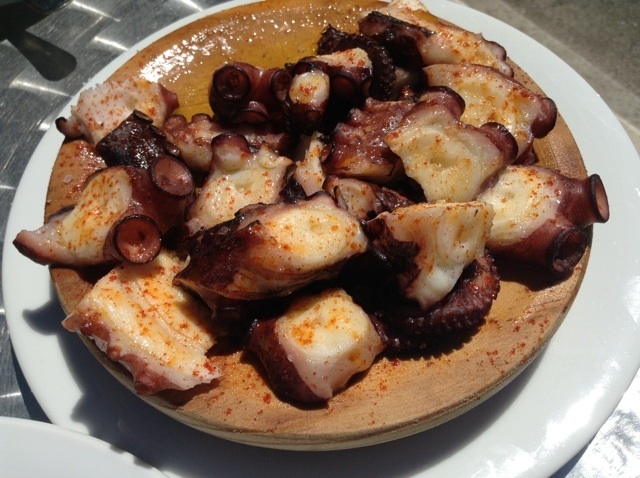 After showering we find a bar with a sunny terrace and order the local dish of Galician style octopus. It was ok. I felt I had to try it, but I don’t feel I need to eat it again! I am now sitting in an old ladies’ hairdressers, having a much needed and long overdue colour on my hair that my daughters so kindly describe as having faded to ‘nicotine yellow’. All the old ladies that have passed through so far have had the same colour brown and a short back and sides cut, and I am getting a bit worried. However two hours later and with a huge amount of hair cut off, I have avoided the buzz cut and am very pleased with the result. The lovely lady charged me only 22-€ (although I paid her 30-€). Even Ella (who is a trained colourist) is impressed and I can walk into Santiago tomorrow with my head held high. When I returned to the albergue the hospitalero didn’t recognise me until I told him I had been to the hairdresser that he had recommended. Once the penny dropped, he was very complimentary. So off to dinner now and a reasonably early night ready for our big day tomorrow. 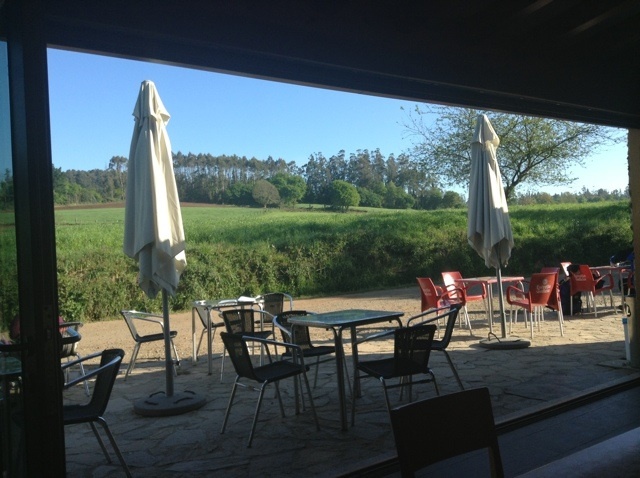 This entry was posted in Camino de Santiago de Compostela, Walking the walk and tagged Arca do Pino, Arzúa, Camino blog, Camino de Santiago blog, Camino de Santiago., Camino Frances. Bookmark the permalink. You look really good I like the hair cut. Have a good nights sleep. Santiago tomorrow well done, enjoy the glory you deserve it. Nice haircut! I’ve received (and read) all of your posts, and enjoyed them tremendously. It sounds as much a spiritual journey as anything else, although that’s not to take anything away from the walking! I had to laugh when you said you were tired a couple of nights ago – after 26 straight days of an average of c. 30 km per day! And you a “non-walker”…. I hope your last day goes well – I’m off for some lower grade manure tomorrow, while I have a “fee” day and some helpers! Thanks for your support. Have reached Santiago and met up with Peter, who we walked with during the first week. Had a nice lunch with a bottle of cava – a bit more expensive than I am used to paying in Mercadona! Congratulations Maggie! I thought we did a lot of walking, but nothing compared with your effort, you should be really proud of your achievement – although I think you’ve a bit more to do yet? Finisterre is one of those places that I heard on the Shipping Forecast all those years ago, but never had a clue where it was. I do recall however that the weather there was always pretty foul, so you’d better keep your hairnet on! Looking great Maggie. Hope your knee and Ella’s feet keep you both going for the last stretch. St James’ anniversary is neither the birthday nor the date of death. It´s the name-day of James. The trees in your photos do not look like eucalypts. Possibly they have adapted to strange foreign climes. But I have seen them all over the world, (except India) and everywhere they look the same as at home here in Oz.